By Scott Gilfoid: #8 WBC heavyweight contender Manuel Charr (23-1, 13 KO’s) is reportedly at the top of the list for David Haye’s comeback fight on June 29th at the Manchester Arena in Manchester, UK. Haye’s manager/trainer Adam Booth had been talking about there being five unbeaten top contenders that they were looking at to pick from for Haye’s next fight, but it’s looking like the once-beaten 28-year-old Charr could be the guy that gets the fight, according to the Sun. 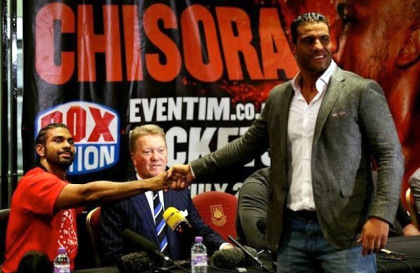 Charr recently sent out a press release volunteering to take the fight with Haye, and he crashed Haye’s post-fight press conference last July in London after Haye had demolished domestic level fighter Dereck Chisora in five rounds. It looks like Charr’s persistence had potentially paid off if he does indeed get selected by Haye for this fight. This is a safe fight for Haye because Charr is painfully slow, and incredibly easy to hit, as we saw in how easily WBC heavyweight champion Vitali Klitschko was able to tag him last year in September. Vitali tore Charr’s face up in stopping him easily in the 4th round. I’m really hoping that fights someone a lot better than Charr, but I can’t see that happening. Haye’s pattern in the past has been to take on easy guys to get a title shot, so I don’t expect him to break this trend. Charr is technically a contender at #8 WBC, and so he will give Haye a boost in the rankings. But as far as it being a tough or competitive fight, no way will that happen. Charr is too slow. I’d rather see Haye fight Deontay Wilder, Kubrat Pulev, or Magomed Abduslamov. In other words, I’d like to see him face guys that have excellent chance of knocking him out. That’s pretty much a dream because you know and I know Haye won’t fight those guys because they’re just too damn dangerous.